©2017 yiupai.com All Rights Reserved. Travel and photography go together like cheese and wine. But traveling to an unfamiliar place to take amazing pictures is not as easy as one may think. Amateur and professional photographers who travel to an unfamiliar place or foreign country often have a hard time finding the right place to take the photos they want. The founders of YiuPai, are a group of seasoned photography enthusiasts who ran into the struggle of trying to find the right locations in a limited time to get their desired photos during several of their business and personal trips. 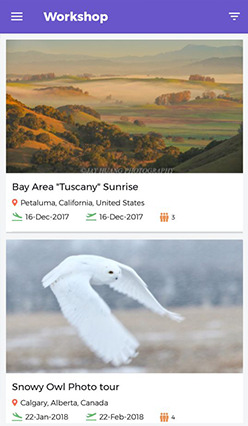 There were no APPs to provide a way for travelers to connect with local photographers. YiuPai was founded as a platform to connect local photographers with traveling photographers around the world. 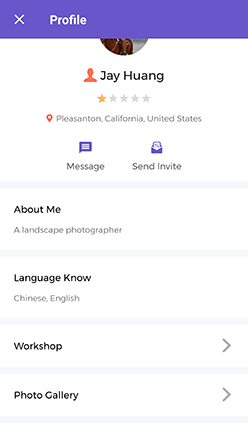 For local photographers, YiuPai provides an easy way to share their experiences and knowledge. For travelers, the help of local guides can allow them to shoot in new and interesting places with peace of mind, allowing them to focus more on their photography. 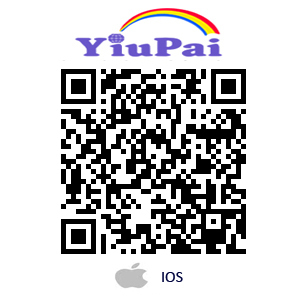 As a registered user, even you are not traveling you can still use our YiuPai APP to find the local photographers for all of your needs. Do I need to sign up to use the APP? How do I become a photography guide? 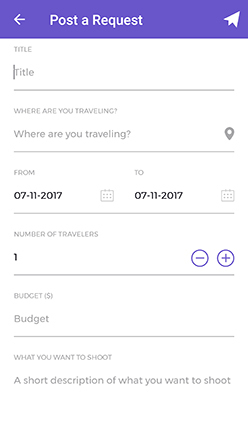 After you have registered as a traveler, click the “become a guide” button on the home screen, and fill out the required information. Yes, refer to Yiupai’s private policy for details. Why do I need to attach a copy of my driver’s license as a guide? 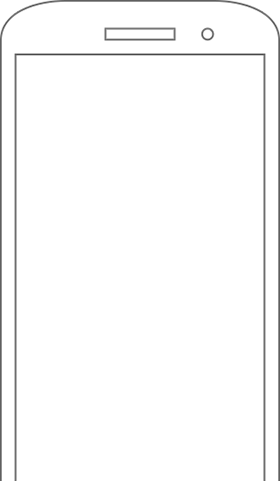 This is to make sure you have a valid driver’s license which matches the information you provide. You can download the app from Google Play for Android or App Store for IOS. Do I have to use the mobile app? 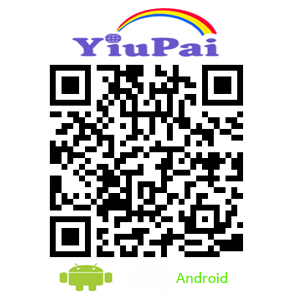 Or can I use YiuPai via Browser? You need to use the mobile app. 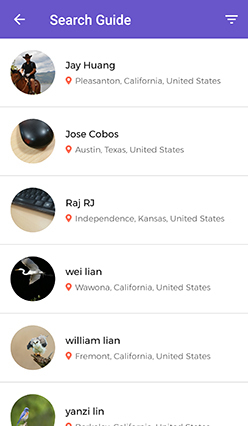 Is YiuPai available outside of the United States? Yes, it’s available outside of the United States, but some functions may not fully work. It’s free to register as a traveler and as a guide. As a guide you will get paid after your trip service to the traveler is done. Once we get the trip done notice from traveler, we’ll send you the money. The rate of commission fee may vary depending on the amount of the transaction and other factors. For initial launching period, the rate of commission fee will be 0% on top of charging fees applied by financial institutions. What paying options do I have as a traveler? You can use PayPal, Credit Card or Bank Transfer. Post your photography trip requests, the requests should include location, date, estimated times, party number, and what you’d like to shoot (such as famous local landmark from a unique angle, local birds or wildlife). You can attach a detailed description with files or pictures of what you plan to shoot. You can also select your preferred language and give a target price. Call for a group photography trip (shared trip) and get a better price from the guide. Search the guides around the world. 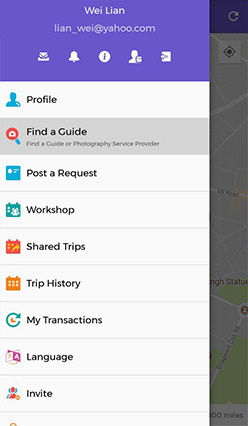 You can also send invite to local guide to see if he/she is interested in working as your local photography guide for your trip. Sign up as a travel photographer first. Click “become a guide” button, fill out the needed information, and wait for approval in a couple of days. Search for requests posted by travelers. You then bid for the one you are interested in. 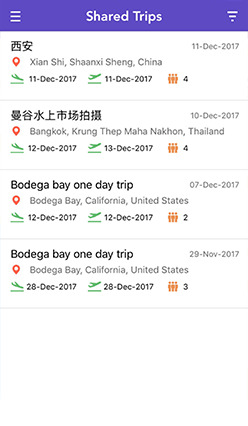 You can also post your trip plan and workshop plan, so photographers around the world can see them. If you plan to go someplace to take photos, you can search if other photographers are also interested, and take them with you and make some money to cover your expenses. Can I share the tour with other travelers? Yes, you can share the trip with other people. Do I need to tip my photography guide? Can I invite others to join me after I have booked a trip? Please contact your trip guide to see if that is OK.
Do I need to be a professional photographer to become a guide? No, as long as you are familiar with your local photography locations you can be a local guide. 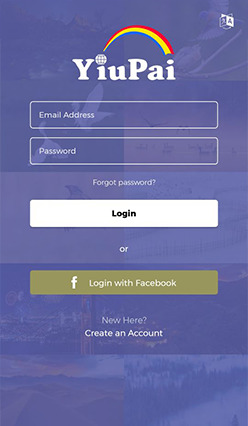 Once registered, users will be able to login using their registered login id and password. 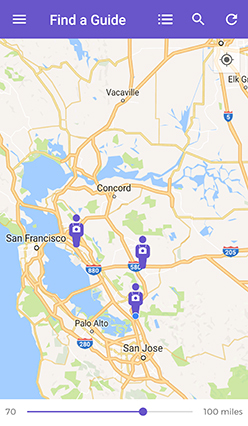 Using 'find a request' to search photography request near by you. This allows guides to post/manage the workshops they organize for travellers. 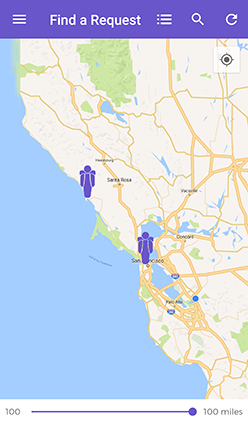 Directly search for local photographers by hashtag, location, category and rating. These workshop details can be viewed by travellers and they can directly contact a guide. Detailed Guide Profile. 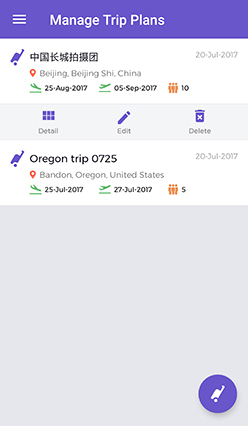 Traveler can directly send invite for their Trip Request. Post your photography trip requests, the requests should include location, date, estimated times, party number, and what you’d like to shoot (such as famous local landmark from a unique angle, local birds or wildlife). You can also select your preferred language and give a target price. 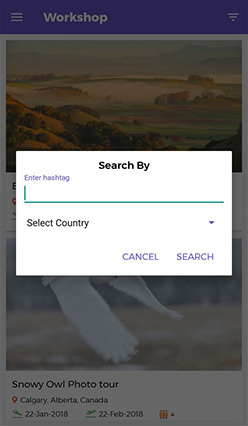 Using “find a guide” to search photography guides within 100 miles from where you are using maps or search guides using hashtag, country, rating filters. Click on guide icon you will see the profile of the guide, you can send invite or message to him/her, can check his workshop, gallery and review. 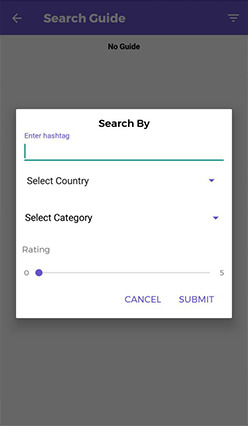 Search guides using hashtag, country, rating. All posted shared trips by other travellers to join. 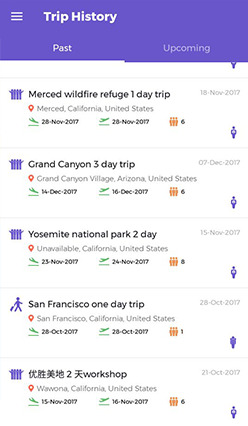 View the detailed statistics of previous and upcoming trips with details like date, time, cost, where, service provider’s name or travel photographer’s name.